Set within the walls of the famous and age-old Galle fort in along Sri Lanka’s coastline, Villa 41 Lighthouse Street offers a unique holiday experience wherein guests have the luxury of taking long walks along the beach, lazing about beside a private swimming pool, bask in the Dutch-inspired architecture of Galle, and simply enjoying a moment or two in natural splendour. Surrender yourself to the understated beauty and chic minimalism of the villa, which has several recreational facilities including a pool table and light-up bar for the sake of guests. 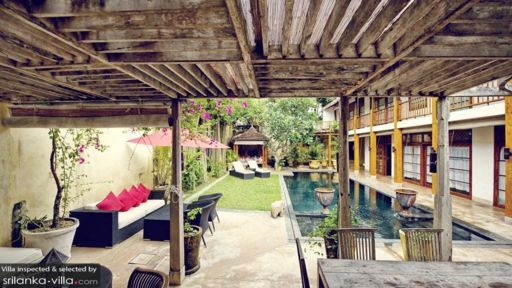 With three bedrooms, the villa is indeed ideal for a family holiday in a UNESCO World Heritage Site! You can choose to book any number of the three exclusive bedrooms at Villa 41 Lighthouse Street as each of them features world-class facilities including a corner seating area with plush couches, a writing desk, an iPod dock, and air-conditioning. There are four-poster double beds with quality bedding in each of the three bedrooms, and they are even accompanied by en-suite bathrooms. The master bathroom features a copper bathtub while the other bathrooms feature walk-in showers along with other necessary amenities. A two-storey, rustic structure, and a garden that has several trees dotting its periphery, Villa 41 Lighthouse Street instantly provides a relaxed atmosphere for you to make yourself at home. There is an 8-metre swimming pool in the garden which hosts two water features spilling into the pool waters in an almost zen-like stance. Flanking the pool are sun chairs for resting, a gazebo with a daybed for a nap, and even an alfresco seating area to relish a cup of tea in the morning! On the porch, guests will find a dining table as well as a corner lounge where you can enjoy a hearty breakfast. Featuring open-plan living, Villa 41 Lighthouse Street boasts of a lavish living and dining space that is accessible directly from the porch. With an eight-seater dining table taking centre stage, the first room is designed for utmost comfort with additional sofas, chairs, and antique cabinets holding opulent crockery! 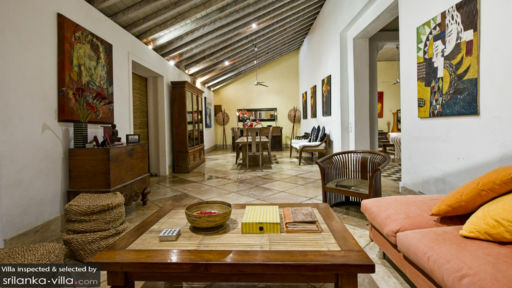 Traditional pieces, sculptures, and artwork grace the interiors of this room as you can make when you step in. In the corner, there is a bar with bar stools that lights up on sundown! Adjoined to the dining area is the living room with plush sofas, and plenty of space for everyone to mingle, enjoy a glass of wine, and catch up for old times’ sake! A massive flat-screen TV is set in a console that also serves as a bookshelf. There is a pool table in the room as well, so you can challenge your friends and family to an impromptu game. Guests choose from an extensive food menu for delicious treats prepared especially for you by the villa chef! With daily housekeeping and on-call staff, you have everything you need to make this holiday one to remember! A personal chef will look after your culinary needs, while you relax with a drink or two out on the sun deck. Massages and transportation can be arranged as per request as they are charged for additionally! 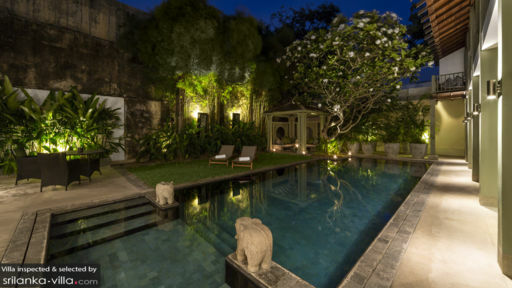 Undoubtedly, the villa is located perfectly in the Bay of Galle, within the fortress walls that is steps away from the ocean. Surrounded by Dutch architecture and a world of history, you are free to roam the streets, explore vintage store, and cafes for an enriching experience. There are restaurants and bars like Punto Café and Pilgrims Lounge for drinks, good food, and even better conversations!